Garage floors take a lot of abuse and a high quality epoxy garage floor paint can keep them performing at their best for years to come. Think about what happens to your garage floor on a daily basis. You drive over it with your car, which probably drips all kinds of oils and fluids onto it over the years – not to mention the snow and road salt that melt off your car in the winter time. You tromp in and out of your garage day-after-day with muddy shoes and boots. You drag dirty lawn mowers and yard tools into it. And, you probably store all kinds of paints, chemicals, and other noxious stuff (like your garbage) out there too! Sealing and protecting the concrete floor in your garage is essential. Because, once it’s damaged, it can be nearly impossible to repair. Standard household paints are not going to get the job done. Latex paints and even oil-based enamels are just not tough enough to stand up to the kind of abuse a garage floor gets. The only type of paint that will do is an epoxy paint. Epoxy paints come in 2 parts – a resin and a hardener. When mixed together, they undergo a chemical reaction which creates an extremely tough protective coating with excellent hardness, and good mar and abrasion resistance. Equally important for a successful garage floor paint job is properly preparing the concrete surface before painting. The best epoxy paints will fail if they do not bond well to the concrete due to dirt, oil, water, or other materials that are not removed before the application of the epoxy paints. Looking for a water-based, two-component epoxy garage floor paint that delivers a semi-gloss coating that is two times stronger than concrete AND looks amazing? 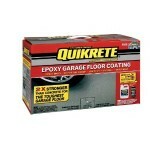 Quikrete’s Epoxy Garage Floor Kit delivers the toughest garage surface in one coat. This epoxy paint is fortified with a new, heavy-duty resin technology that provides durability that is superior to other garage floor paints on the market. After spending the time and money applying epoxy garage floor paint, you want to protect the finish for years to come. One excellent option is the Drymate Garage Floor Mat. All year long the weather brings snow, rain, mud and outright grime can damage the floors in your garage and your home. Every time you drive your car into the garage, it tracks in the elements that can destroy your floor’s finish. This non-woven fabric parking pad rolls out quickly and easily to protect and beautify your garage floor. 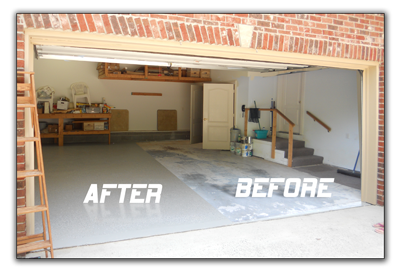 The Rust-Oleum EPOXY shield garage floor coating is designed to create a showroom-quality finish on your garage floor. Rust-Oleum EPOXY shield is specially formulated to protect your garage floor against contact with gasoline, antifreeze, motor oil, salt and hot tire pick-up. The garage floor coating kit includes concentrated floor cleaner for surface preparation, a 2-part water-based epoxy coating, decorative chips, paint stirring stick, detailed instructions and an instructional video to guide you through the painting process. Epoxy Garage Floor Paint is powered by	WordPress 4.9.3 and delivered to you in 0.261 seconds using 41 queries.